Pleasant Path is the name of the east-northeast region of the Mushroom Kingdom and home to some Koopa Troopas. 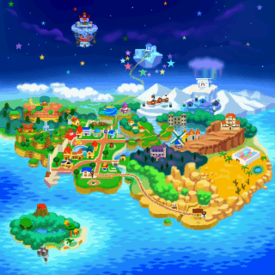 It is the setting of Chapter 1 during the events of Paper Mario. After the completion of Chapter 5, Kent C. Koopa blocks the west exit of Pleasant Path. 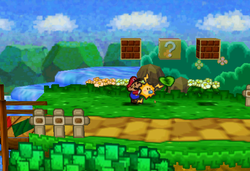 If the player wishes to go through Pleasant Path in this way, the player can defeat Kent C. Koopa before proceeding or they could alternately pay him 100 coins to pass. However, it is possible to go to the other side by unlocking the pipe from Toad Town Tunnels and Koopa Village. If Mario walks around the Candy Canes, they will play a cover of the invincibility theme from Super Mario Bros. and give him one heart each time he circles it. Mario and Bombette in the third scene. Mario first enters Pleasant Path from Toad Town. The first scene is straight, with a Koopa Troopa, a Paragoomba and a Spiked Goomba, as well as various blocks where Mario can find coins, a Fright Jar and the Dizzy Attack badge. On Mario's way back to Toad Town after clearing Koopa Bros. Fortress, Jr. Troopa will jump out of a bush and ask Mario if he knows him. Either way, the two will get in a fight. After Chapter 5, Kent C. Koopa will appear here, blocking Kolorado and Mario from passing. Mario can pay or fight with him in order to pass. In the second scene, there is first a ? Block with a POW Block item in it, then a river. Mario must hammer the tree and press the ! Switch dropping from the tree to make a bridge appear. Over the river are a Spiked Goomba above a brick, a walking Goomba, and some stairs. To the south is an island with a Star Piece on it, which Mario can get by tossing Kooper. On the first stair, a Sleepy Sheep can be found behind the fence. On the second is a Koopa Troopa. Finally there are four bricks, the last of which contains multiple coins. The bricks before Koopa Village that reveal the Attack FX B badge. In the third scene, three Candy Canes can be found on the high area. They give out Heart if Mario walks around them. There is also a Honey Syrup behind the last Candy Cane and a Star Piece under a hidden panel between the three. There is also a roadsign. From the high area Mario can either go across the bridge to the next scene or take the stairs around the platform to Koopa Village beneath the bridge. 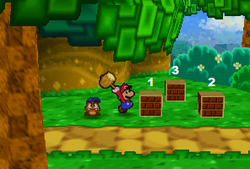 Before the entrance of Koopa Village, there are three brick blocks on the ground. Hammering them in the order of left, right, back reveals a red ? Block with the Attack FX B badge in it. Yours truly, The Koopa Bros. There is an ! Switch across the river, which Mario has to activate in Chapter 1 by tossing Kooper from Koopa Village for a bridge. 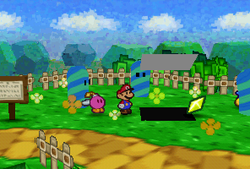 Finally there is a Paratroopa as well as two bricks, between them an invisible block containing a Fire Flower. In the fifth scene (the path before Koopa Bros. Fortress), there is first a tree by the north side with a Star Piece in it, then a Koopa Troopa and a Paratroopa on the road. At the end of the road is a Heart Block. After Bombette joins the party, Mario can set her off at a cracked wall and take the pipe behind it. This warps Mario to a high place where he can find a FP Plus badge in a treasure chest. Outside Koopa Bros. Fortress is a Save Block near the main gate, a Save Block in the south balcony, and the Refund badge in a treasure chest on the southeast one. The in-game map description reads, "This path links Toad Town and Koopa Village. Koopa Bros. Fortress is to the east." For enemy formations in Pleasant Path, see here. Note: The scenes are numbered from west to east. Dizzy Attack In the Badge Block at the first scene. Fright Jar In the rightmost block at the first scene. POW Block In the ? Block at the second scene. Sleepy Sheep Behind a fence in the second scene. Honey Syrup Behind the rightmost Candy Cane in the third scene. Attack FX B Smashing the blocks near the entrance of Koopa Village in the order "left, right, middle" will reveal a red ? Badge block with this badge inside. Fire Flower In a hidden ? Block between two Brick Blocks at the east of the fourth scene. Under a hidden panel between the three Candy Canes in the third scene. Under a hidden panel at the coin trap in the fourth scene. In the tree at the fifth scene. FP Plus On a high platform near Koopa Bros. Fortress, accessed through a pipe by blasting the wall near the Heart Block first. Fire Flower In the area two screens west of the Koopa Bros. Fortress, the hidden ? Block is between the two Brick Blocks. To the west of here is Toad Town, and to the east is Koopa Village. If we go even farther east, we'll eventually reach Koopa Bros. Fortress. It's always pleasant around here. That's why we call this place Pleasant Path. It's nice and warm today, too. Incidentally, lots of Koopas live around here. Koopas like to live around Pleasant Path because there's plenty of water for them to lounge in. Koopa Village is down this way. If you want to go to Koopa Bros. Fortress, we should take the upper path and just keep going straight. If we continue along the pass, we should reach Koopa Bros. Fortress. Many Koopas and Paratroopas live around here. If they're loyal to Bowser, they'll definetely attack us. Just east of here, we can see Koopa Bros. Fortress. Actually, we're probably already on fortress grounds. That arch certainly looks like a part of it. And there are lots of bad guys, too. The Star Piece in the second scene. The Star Piece in the fourth scene. The Star Piece in the fifth scene. This page was last edited on July 23, 2018, at 18:26.